The Joli Times: An apple a day keeps the teacher away! An apple a day keeps the teacher away! Someone was hungry. 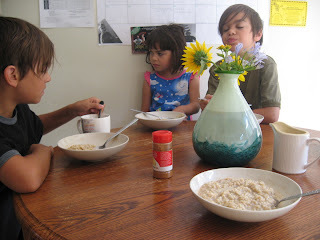 Hmmm, but how to start the day.... Our old friend oatmeal arrived on the scene just in time to help wake up our groggy troops. Shake the feathers from your hair my pretties. It's breakfast time. Good thing everyone likes this particular breakfast of champions.....( sorry Wheaties) we have at least 7 more pounds of this lovely grain to go. We can do it. 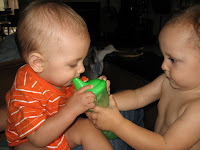 Super charged and ready to go, our little guy catches the true spirit of community by offering his good buddy a bit of sippy cup refreshment on a hot summer's day. Our experiment is paying off already! 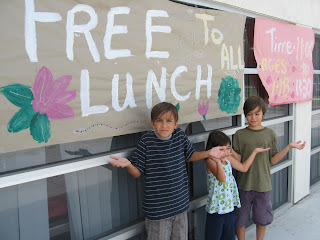 In the last few days we heard tell of free kids lunches. 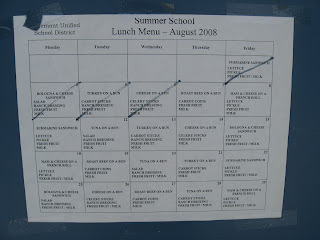 In a few locations in our town there's suppose to be free lunch for kids 1-18 years throughout the summer. Kids eat free, adult admission is $2. 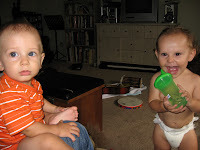 We tracked down these whereabouts and Papa J headed out with the three older kids while Mom put the baby down for his nap. 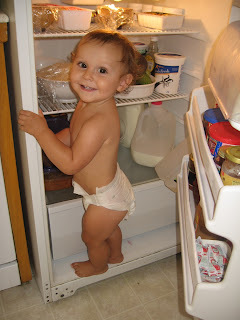 We had plans to feed the kids this way and Aleli and James would eat leftovers. On the way there the kids spotted an awesome new fresh juice and smoothie shop offering free samples and discounts as part of their opening. Today we could only participate in the sampling, but you can bet we'll be back in a few weeks to support this business and enjoy the fruits of their...... well, fruit! 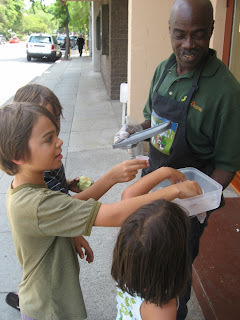 Juice-O-Rama shares some healthy, SA-WEET flavorful tasters. 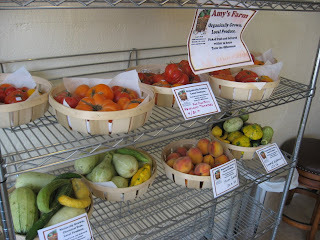 Inside JuiceOrama we love that you can also buy some locally grown, organic produce from Amy's Farm. 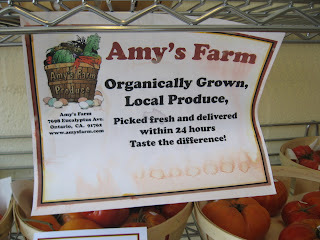 http://www.amysfarm.com/ This farm gives educational tours to kids and grown ups and is a wonderful place to start venturing into food production and/or local food sourcing if you're from these parts. This shop is headed in a really good direction. Hope it does well! 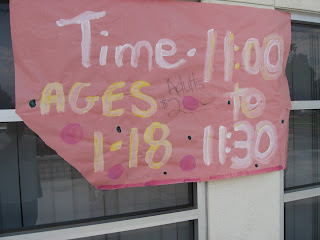 Anyway, the kids got a lesson in punctuality this afternoon. You can miss a really good thing if you're not paying attention to the details. They arrived about an hour and a half too late! 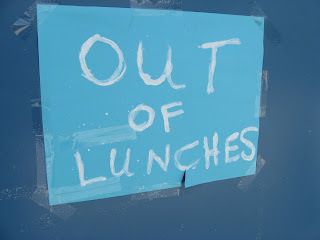 No free lunch today. This location just happened to be the kids old elementary school (we've recently moved a couple miles away in town and they'll have a new school this fall). 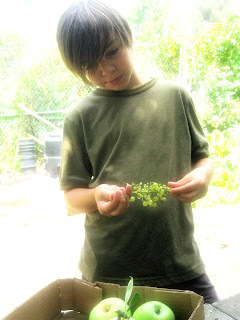 It just so happens as well that they have their own veggie garden that was planted by the students last school year. 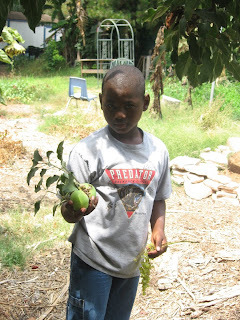 The third graders have planted dozens of fruit trees all over campus. Again. ABUNDANCE! 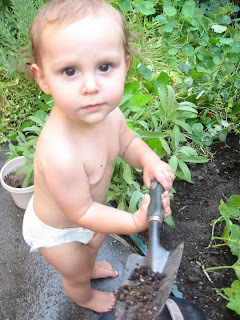 Last year the principal gave repeat invitations to school families and community members to come and pick food from the garden...... otherwise it will just rot. It was time for more picking. 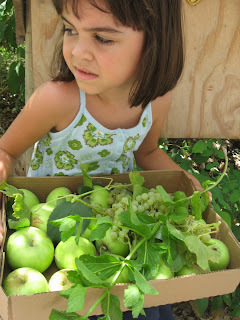 We bump into our old neighbor and friend in the garden and he asked," where did that fruit come from?". He was pointed in the direction of the ripe fruit and we took this picture of him leaving with these juicy riches. Good finds. Found an old discarded box and started loading it up with anything that tasted good. 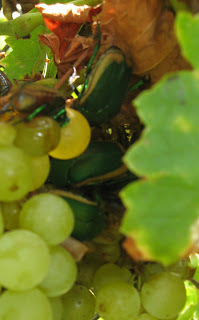 These funky beetles inside the grapes above, didn't make the cut. Our girl went looking for her old teacher. It was a summer day and her teacher was away. She missed her "sssoooo much"! No teacher. 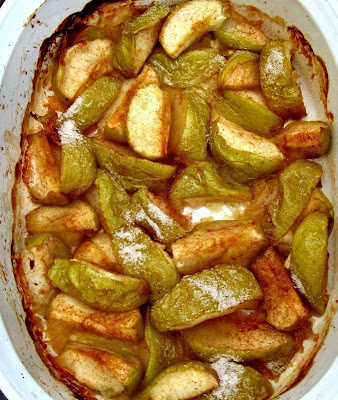 Just mint , grapes and perfect granny smith apples. Maybe next time. 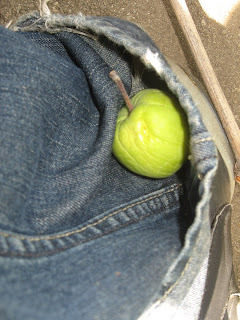 James found this apple in the cuff of his jeans on the way out of the garden. 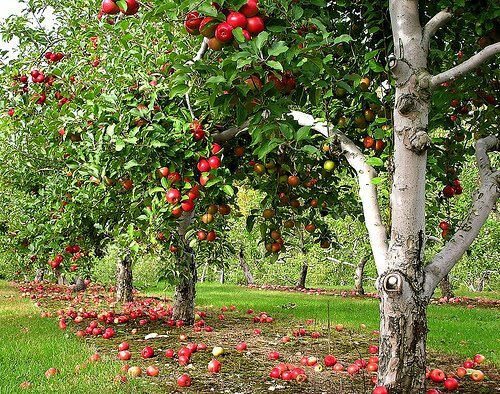 The grounds looked somewhat like the apple orchard on our cover page above. Fruit dropping everywhere! This little treat just jumped right out at him! 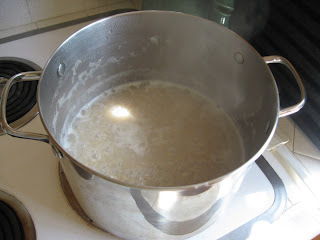 With no free lunch after all, there was a call home to boil some water. 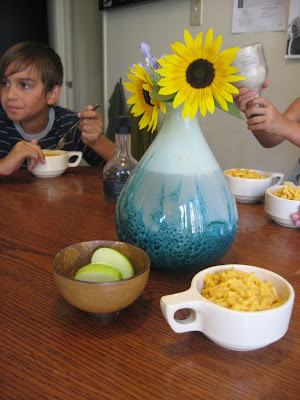 So it was mac-n-cheese with unbelievably fresh apple slices back at home for the fam. We'll try again another day for the free lunch. Mark that calender. Excursions to the supermarket these days have been few and far between. 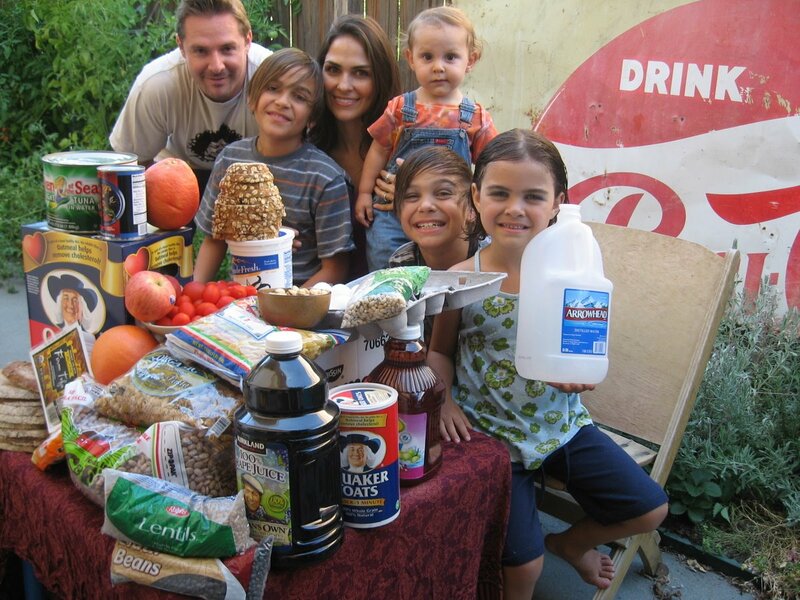 Prior to this experiment we would sometimes go to the store 1 or 2 times a day and it wasn't odd to visit a Vons, Trader Joes, and Sprouts Market all in one day. We typically spend between $200 and $325 a week as well. When we shop now we make the most of it. Using club card discounts and coupons is the way to go. Also, look closely at what you are getting for your buck. The price tags below show the cost of an item in ounces. To make the dollar stretch it makes cents to get more ounces per penny. For example, there were some convenient individual packs of Kraft Microwavable Mac & Cheese. The cost per ounce was around 40 cents. We compared that to a 5 pack of regular Kraft Mac & Cheese that weighed in at around 11 cents an ounce. But wait there's less or more depending on your perspective. A generic pack of mac & cheese was closer to 10 cents an ounce (wow, we're actually comparing ounces now!) Would the kids know the difference between the Kraft brand or the Springfield variety. James was standing in front of the pasta isle contemplating a 7 cents savings ( remember to check the serving sizes too) and wanting to make a kid friendly decision. Is this one really the cheesiest?.......... wait what's this? 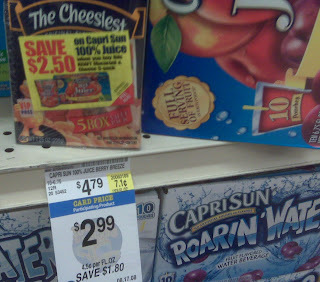 On the flip side of the Kraft 5 pack was a coupon for $2.50 off a 10 pack of Capri Sun 100% juices. All I had to do was purchase the 5 pack of Kraft to be able to use that coupon. The Capri Sun was $2.99 and the store will double up to $1. Decision made! Club card price and doubled coupon that make the juice FREE = PRICELESS! We tried to go back one more time a few days later for the same deal and the club price for the 5 pack mac & cheese had already gone up to $4.99. That's $1 that could have gone towards..........beans. 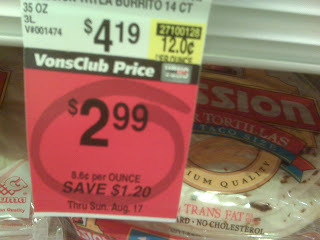 While at the store we did find a good price on a 14 pack of extra large tortilla's. ( see tag above ) These tortillas were 8.5 cents per ounce and stretched over two meals and were even used to make homemade cinnamon crisps. And now a word on beans. 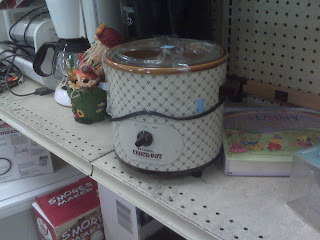 See this photo below, that's a thrift store find on a kitchen utility that should make it's way into a few meals down the road, or later in the day! These things take cooking to a whole new level by slow cooking, retaining vitamins, and making a house smell delicious all day. 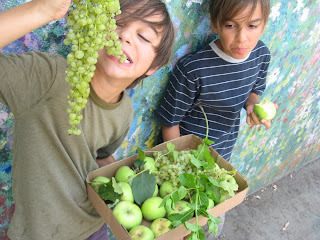 All of this fruit harvesting for survival business has made us way more conscious of the earth. 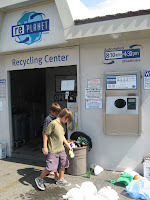 So recycling down at the market suddenly seemed like the best of all possible post lunch activities. 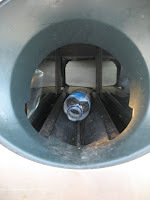 It's just left us with more to ponder about waste and necessity and what not. And it also gave us almost 15 bucks! We of course would not add that to our food budget, but it was a moment of connecting the issues of food, waste and the environment. 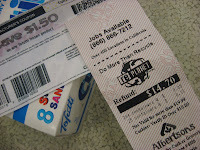 While at the market there was the opportunity to get a treat for the family using some coupon skills. These Tofutti Cuties were purchased using a coupon printed on-line. This was the only purchase for the day. = $2.39. Lots of places are doubling their coupons again. Check around to see what might have changed at your local supermarkets. 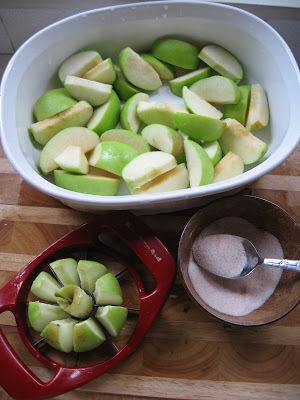 We wasted no time in figuring out what to do with those apples. 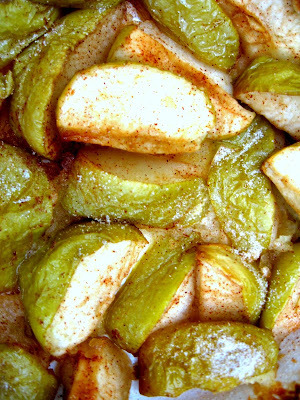 Some sugar, cinnamon, a little butter and heat would be the beginning of a love affair. Wish you could smell this fresh out of the oven! 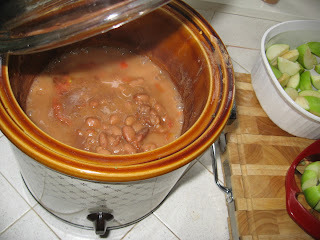 The basics are oh so good slow cooked and properly seasoned! EVERY ONE'S favorite! Even a neighbor had to try it and gave it high marks! 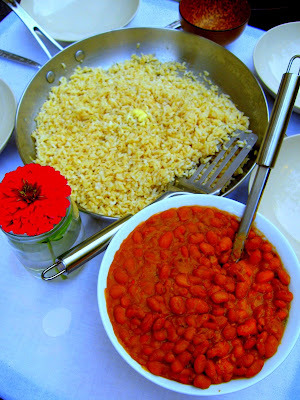 You'll all be seeing variations of this dish again! The perfect end to a busy day. WOW!! This looks very fun! I just LOVE all the pictures... Great job you guys.. 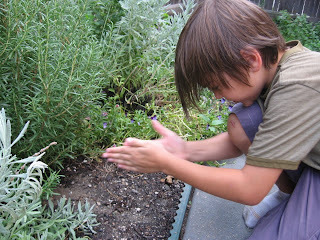 It sounds like you are having a great experience with this experiment... Hugs from Leesa et Alex in France! !